In the world of deployment a reference image is where all begins, basically we take the ISO/WIM from the vendor, install it, tweak it, patch it and on the other side we now a have a customized reference image that is more suitable for our needs. This applies to both clients and servers. There are two ways of doing this, the correct way and the incorrect way. The correct way is repeatable and as automated as possible. This blog is about the correct way and how to automate it just a bit more then usual. You can of coarse modify the script so it will do more, for example upload the images to the correct destination. What do I need to get this working? And for each of them build a VM with the same name as the task sequence. When they are all built it will power them on one by one, booting from the ISO and then run the task sequence that corresponds to the name of the the VM. 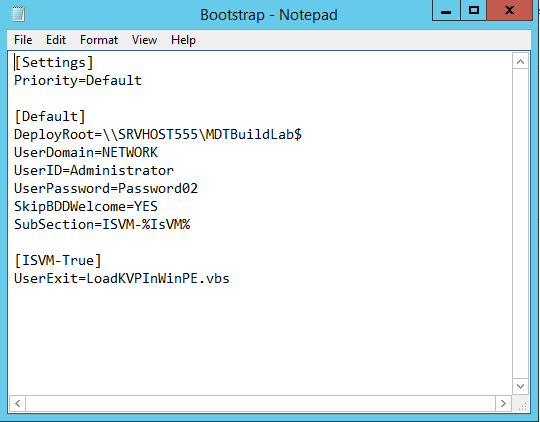 So if you have a TS with the ID of RW81.x86, it will build a VM with that name and run the TS with that ID on that VM. This function will destroy and remove all VMs, it does this by getting all task sequence ID’s from the MDT server, and find corresponding VM’s and then destroy and clean up. Also a manual process, it will destroy/delete/cleanup whatever VMname you type in, note that there will be NO questions, it just deletes them, so don’t type in DC01 or something like that. This is my sample XML file and you need to modify it so it will work in your environment. This will load a userexit script that installs the driver for KVP and create a fake services that will allow it to load. You need to make sure that those two scripts are added correctly and we also need the driver for KVP. 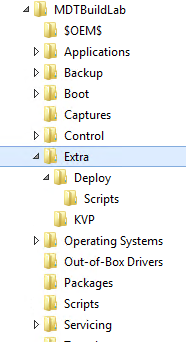 One easy way is to use the “Extra” folder feature in MDT, whatever you put in that folder will end up on the boot image. In that Folder I two folders, Deploy and KVP. In the folder Deploy I have a subfolder called Scripts. 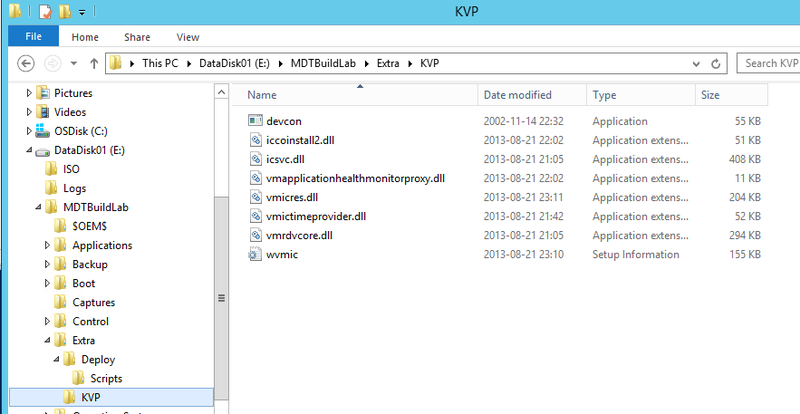 In the KVP folder you need to add the driver for KVP, and that you can do by searching for VMGuest.iso on your Hyper-V host, it is in C:\Windows\System32, mount that is and extract the drivers. In the Boot Image setting for WinPE, for the setting called Extra directory to add, browse to your folder, apply, update boot image. ‘ Write back an unique number to the host to let them know that the variables have been loaded. ‘ Obtain the definition of the Win32_Service class. ‘ Obtain an InParameters object specific to the Win32_Service.Create method. ‘ Add the input parameters. ‘ Execute the method and obtain the return status. Great Post on Building Images! Thanks for your great work. 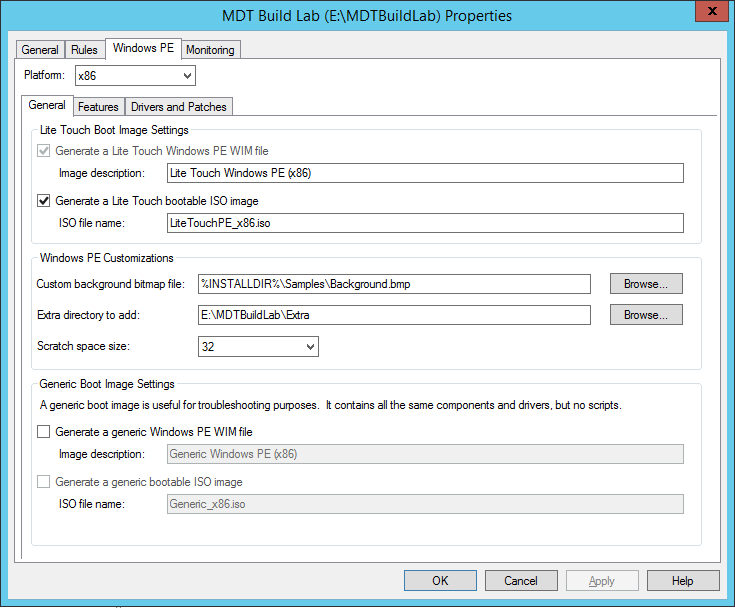 Can I also work with MDT2012 U1? Pingback: Michael Niehaus Notes from TechEd North America | What have I learnt today? Hey Heard you talking about this at TechEd and was really impressed with it, but I am having a heck of a time trying to get it work. Are you offering any sort of assistance with it? Great guide…. put everything into a build with Server 2012 R2 running hyper v.
Running into a small issue… while MDT is processing the [default] rules (see the devcon window run twice) and then the whole vm resets and starts over. Any ideas what could be causing that? Devcon runs once, but it then runs an other process, so you should see 2 windows. The most common reason for that is that it cannot find the Tasksequence. The easy fix is to see if the wizard is picking up the correct info. Set the SkipTaskSequenceID=No in customsettings.ini, that way the wizard stops and you can see if it has selected the correct TS. If not there is a problem with the integration components not setting the VMAlias to the name the TaskSequence have. Thanks — i changed the setting and im not even getting that far. Would it make a difference if i am using ‘Windows 8.1 ADK Update’ versus just the ‘8.1 ADK’? Not sure, since don’t use the update (there is only one reason to use it and that is WIMboot, other then that it is not recommended to use that version) But that could be the reason. The problem in that case would be that it does not load the Integration Services or that the fake service can not start. ” was reset by the guest operating system. So I am a little perplexed. ok, can you post the customsettings.ini file, the bootstrap.ini and bdd.log? Update #2 — got it working!!!!!! The pesky ‘/r’ on the devcon command is what was prompting the vm to restart itself over and over. Once I removed that the process works flawlessly. Great, and thank you for the feedback! From a hyper-v host that is domain-joined, is there any way to to connect using the MDT provider to an MDT server that is in a Workgroup? The MDT provider does not support the use of credentials. If I’m on the same domain, this tool works flawlessly. Thank you very much! I know i must be dim, but: Where is the user Administrator created? It’s not a domain user? Created locally on the box where MDT is running? Stupid question but got to ask: The user Administrator which is used in CustomSettings, is it created on the box that runs MDT? Hi Mikael, Question for you. Using the Imaging Factory, notice that one of my reference images eats the entire Space on the HD when building. I am not sure if its hyper-V doing it or if its the OS itself, but all of the space is gone on the drive. Ideas? Would this process work for building a Windows 2008R2 reference image? Is this working on Windows 10? 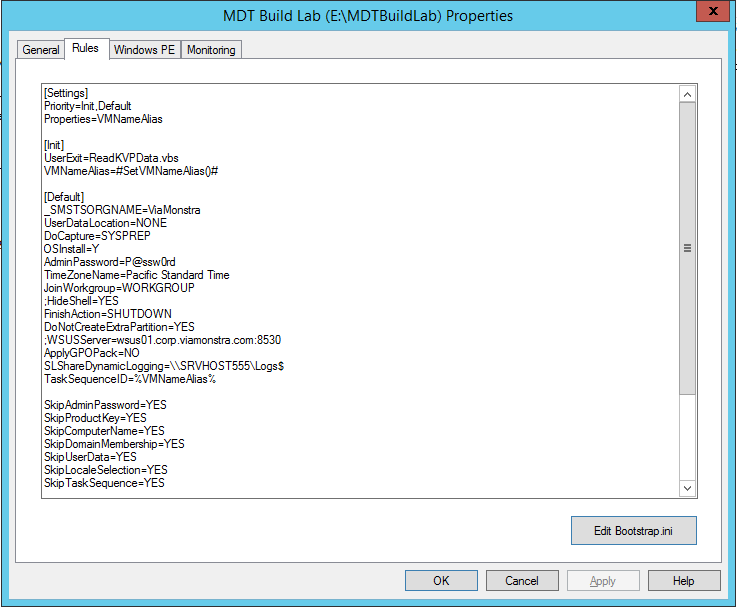 Hi Mikael, have you tested this with MDT 2013 update 1, ADK 10 and Windows 10 ? Would this work with Windows 10 Hyper-v? Thanks Mikael, will the hyper-v integration drivers from windows 8.1 be ok? or will I need to update this? Worked as charm on WinPE 10 X86 with the drivers from Windows 8.1 so it really does not matter, but I thought you would like to know…. I love the post and I love the scripts! Great work. Good to know that I am not the only one that issue with X64. :-) Really looking forward to the new version. Will the new version have multithreading? It would be cool if it was possible to specify a maximum number of threads in the XML so that the script could start up multiple VMs at the same time. I tried to implement this in your script yesterday, but I was unsuccessfull. I tried to use workflow object in Powershell to achieve this. Seems that it is difficult to have a wait inside the workflow. My lab is stuck in “Processing bootstrap settings. Processing rule: Default”. When I remove the bootstrap post “UserExit=LoadKVPInWinPE.vbs” the TS will start. Any ide of what could be wrong? Hi, verify that you are using the x86 boot image with the modifications it needs to have to make the integration components work. It does work on WinPE 10. I am trying to run this on Windows 10 with MDT 2013 update 2. When booting off the ISO it hang’s on Processing rule: DEFAULT, It appears to be not running an exitscript.when looking at the BDD.log. Thanks, just got that part working my problem was using devcon from WDK 10, was the x64 bit version trying to use the x86 boot image. For me, it’s Building the Virtual machine, booting the ISO, but stops and lists the 3 Task Sequences in the REF folder, it doesn’t start the one it’s assigned (Matching the Task Sequence ID) . Any idea what setting I need to tweak to kick off the Task Sequence? Gary, which setting was it you needed to modify? We are seeing the same issue. The image process stops at the Task Sequence selection screen instead of automatically selecting the correct one and proceeding to apply. Hey Mike, Do I need to modify anything in the main PS script if I am only using x64 Boot Media to create my ref Images? What is this about? In theory, yes, “but”, there is no value using a x64 boot image anyway, you should create the ref image on a BIOS based machine, not UEFI. Since BIOS based VM’s does support cross-boot there is no need and no benefit. You also need to have x64 based drivers for WinPE and you also need a devcon.exe that works in X64. So, short story, stick with x85 for boot, that works, no issues and it is plain and simple, it also supports x86 and x64. when is the multithreaded version going to be released? The one you mentioned above “For the Image Factory that works against SCVMM…”. Instead of chasing around for the Hyper-V Integration Components (which I have). You can just go to https://support.microsoft.com/en-us/kb/3063109 and download it there. In reading Michael Niehaus’ post on the “Image Factory” he has an option to select MaximumRunning VMs at a time. Is there a reason you did not include that in your solution? We are building reference images for all Microsoft supported OS and all languages so doing 300+ images in a serial fashion would take forever. I just wanted to understand if there was a technical reason not to have several VMs running at the same time if the HyperV system has the resources available to it. Mikael, your scripts are fine! I’ve been unsuccessful in setting this up in my lab for the past two days. Can you please offer some assistance. I apologize for the length of this comment… but oh well here I go. I’m not having any luck with this. This seems to be for remote Hyper-V VMHosts. I am running my Hyper-V instance on my local Windows 10 Enterprise Client system with the Hyper-V feature installed. If there is an up coming post, I’ll just wait for that. mcgowanbl, this is a problem with devcon.exe from WDK10. This factory work fine only with old devcon.exe (2012 year old) from link of this blog article. This link is broken now (no free download from Microsoft available). Try my project cMDTBuildLab for build MDT server with worked boot ISO: https://github.com/pvs043/cMDTBuildLab/wiki. Mikael Nystrom, what’s about extra.zip with devcon.exe from WDK10? Join to project at GitHub, and post Pull Requests! This does the same that is described in article http://deploymentresearch.com/Research/Post/540/Building-a-Windows-10-v1607-reference-image-using-MDT-2013-Update-2, but full automatic! Please, try it and send comments. At ignite this year I noticed that you were using an ImageFactoryv3 powershell script. Are there many changes between version 2 and version 3? I did not see v3 on your onedrive share. I’ve pretty much followed every step as far as preparation and still having issues executing. Was wondering if you could offer any assistance. Essentially generating an error when trying to execute New-AutoGenRefImages function of “Unable to Find ISO, exit” and I can confirm the iso to boot to the MDT is located there. New solution, that works with a remote hyper-v host, no blogpost on that yet, but here is the link https://github.com/DeploymentBunny/ImageFactoryV3ForHyper-V the test part is not ready, but build is. Can I include your script ImageFactoryV3-Build.ps1 to my project? Slow clap. Nodding head. Godfather style. There is a new version of this, final testing in a production environment.